By the time summer rolled around, we had put together several smaller bike-related programs. We wanted to do something bigger. We decided to close our side parking lot and throw a BikeFest. The Mountain View Library BikeFest will create a space where bicyclists and bike organizations can gather together to celebrate bicycling in all its many variations. It will take place on Saturday, July 12th between 10 am and 1 pm, and will attract community members of all ages. It will take place in the surface parking lot adjacent to the library on Franklin Street, and may possibly also spill over into Pioneer Park. We are looking for organizations who would like to participate. While your participation can be as simple as setting up a booth to answer questions, we would prefer for you offer a hands-on activity. This activity could be something like bike tune-ups, “test drives,” fittings, bike-related crafts or coloring, helmet adjustments, a rodeo or obstacle course, etc. Or it could be something entirely different and bike-related. We’re happy to discuss possibilities with you. Creativity encouraged! We hope to create a street fair atmosphere, similar to San Francisco’s Sunday Streets. 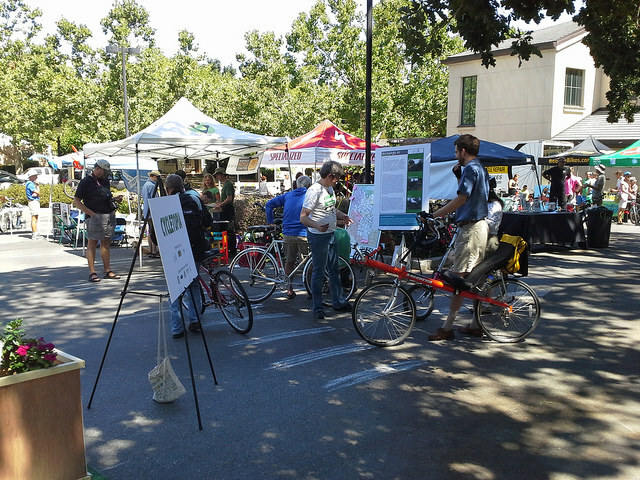 Cycletopia: a demonstration protected bike lane put together by Safe Streets Mountain View. It provided a green carpet entrance to the festivities. Curators from the Pedal Power exhibit, which was on display at the Los Altos History Museum, brought a watt-meter bike which measured how many watts a patron generated by pedaling. Great Streets Mountain View brought a small model of city streets where patrons could design their own bike lanes. signs, crossing train tracks, and identifying hazards on the road. They also brought a blender bike, and we enjoyed making and eating bike-powered smoothies. The Silicon Valley Bike Coalition brought their spin art bike. Patrons pedaled to power a paint spinner, making cool designs. The Bay Area Bike Mobile came to do free tune-ups and repairs. Beeline Bikes also did free tune-ups and repairs. Cognition Cyclery brought an electric bike that patrons could test drive. They gave away free water bottles, answered questions, and yes, did free tune-ups and repairs. The local YMCA brought three exercise bikes and did pop up spin classes. In addition, Cycle California magazine sent us a big stack of magazines to give away. And of course the library set up a table with plenty of coloring activities available for everyone. All in all, it was a great way to get to know some of our local bike organizations, and to introduce patrons to them as well. I saw a lot of good conversations and people having fun. But to be honest, one of my favorite moments was seeing an eight year old boy trudge up to the Bay Area Bike Mobile with two flat tires and then ride away laughing after they were fixed. We hope all of our events are as much fun. Editor’s Note: This is the fifth Mountain View Public Library Bike Stop blog post focusing on the results of their Pacific Library Partnership Innovation and Technology Opportunity Grant Program. This series is written by Emily Weak, Adult Services Librarian at Mountain View Public Library.